How do you guys see the usage of these two unique gems . . . ? The mana cost here is no problem, cyclone and l.warp are both level 1, so mana cost still very low (even doubled). -10% is a big hit, but also a nice dps increase . . .
Level 73 atm and going rly smooth as im progressing through the leveling tree. Dont have your sugested weapons yet tho so im using the Nycta´s lantern atm for the ele damage. Find that wand today tho and im wondering what offensive stat i should prio? Not the OP, but either/or is fine. With fire damage, it's increasing specifically the fire damage you do. Elemental increases the fire damage as well, but if you have added cold or lightning damage to attacks (as you should to proc EE), it applies to that too. The DPS difference between the two in this build is virtually unnoticeable, so things like fire damage, elemental damage, and area damage are all desireable. I don't like either of those. Rares with life, fire/area damage are better for this build IMO. The more life, the more survivability you have, and of course, greater damage output. Sometimes a few hundred HP is the difference between life and death. 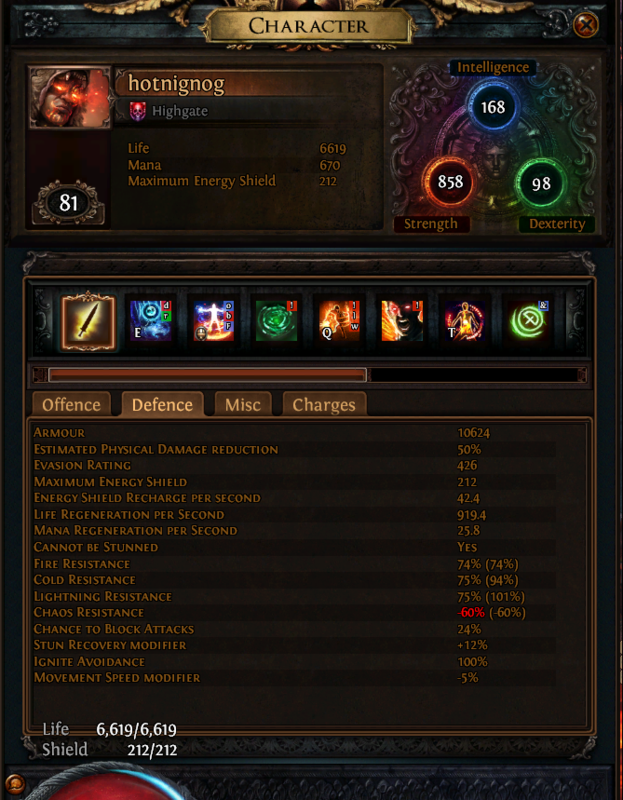 Because i'm new to the game and i'm trying to learn to level fast and because i wanna start next league with this build. I Made a Cheat-Sheet about how to level it the most efficient way as a first league character. Nice one! I'm actually going to use this next league as a QRG of sorts. Thanks! I'm curious why you use increased burning damage gem in the RF link instead of Iron Will? Does Iron Will not work with RF? If it does having that with 800 str is a huge deal. I need some advice or some comments on my char, if you have a moment. Big thank you for the fun build, maybe one day i'll go kill atziri, never done her, lol. Hi, Ive been following this build recently and its great! My best char yet. Hi! I was planning on starting the Breach league using this build and I was wondering if it was Uber Atziri viable? I play on softcore so 1 or 2 deaths doesn't matter to me, but I'm wondering if the build, with the right gear (Kaom's, good jewels, high life rolls on all gear, level 90) can kill Uber Atziri consistantly.